An important theoretical contribution to the understanding of motivation crowding out comes from psychological literature with Cognitive evaluation theory. This theory suggests that extrinsic rewards will only undermine intrinsic motivation if perceived as controlling, while they will have a positive effect on intrinsic motivation if they rouse feeling of competence. 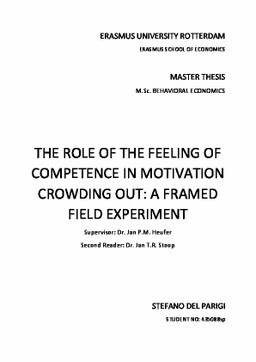 Building on this insight the current thesis investigates the role of the feeling of competence on the perception of incentives. A framed field experiment involved university students from two different backgrounds (technical and nontechnical) facing two tasks pertaining those two backgrounds. For each of the two student backgrounds, a treatment group received (monetary) extrinsic rewards and a control group did not. The hypothesis tested was that, due to the relevance of the feeling of competence, the extrinsic rewards would have been more effective (rising the performance to a higher extent) on students facing tasks matching their field of expertise. Within the empirical analysis, the data obtained from the experimental sessions were analyzed with parametric, non-parametric and regression techniques. No evidence in support of the hypothesis stated above emerged, while evidence of motivation crowding out did.